Most of my friends, colleagues and patients know that I am passionate about prevention. My family, my friends and my patients have all been touched by oral cancer. Oral cancer is no fun. Your dental professional is trained to evaluate the health of all the oral tissues. If you have even the slightest concern, have it checked out. Please. Oral cancer is more common than you think. More than 40,000 cases of oral cancer are reported every year. 8000 Americans are killed each year by this form of cancer. The death rate for oral cancer is higher than cervical cancer. Most of these cases are found on the tongue or floor of the mouth. Lips, cheeks, gums and palate can also be affected. Early detection is crucial. Most oral cancers can be removed surgically when they are detected early. The earlier a cancer is detected and treated the greater the survival rate. Historically tobacco users were at the top of the list for developing oral cancers. Today excessive use of alcohol, exposure to the sun and individuals with the human papilloma virus are at increased risk. Oral cancer is typically painless in its early stage. It can be a discolored patch in the mouth. Thickened tissues or lumps in or around the mouth. White patches where folks keep their smokeless tobacco are usually pre-cancerous and can become oral cancers with repeated exposure. As a malignancy progresses some of these lesions or lumps may become painful. Persistent hoarseness or difficulty swallowing can also be associated with a cancerous lesion. What is involved in a cancer screening? Most dentists include an evaluation of the soft tissues as part of a regular course of preventive dentistry. This screening, performed once every six months is crucial in evaluating the tissues. If you feel something looks or feels differently be sure to mention it to your dentist or dental hygiene professional. A more advanced form of screening involves a special acetic acid rinse and or a light source that causes irregular cells to glow. This exam is offered by some dentists on an annual basis. If you are (or were) a tobacco user, this exam is a valuable tool. Screening exams are not designed to diagnose cancer. They are designed to screen out the healthy tissues so that more advanced testing and diagnostics can be performed on those who need it most. A suspicious area will be biopsied, a small sample of tissue will be sent for microscopic examination. The results of this test will determine if additional treatment is necessary. No one knows for sure what causes a cancer to start. However, reducing or eliminating risk factors is a good way to reduce the risk of developing a cancerous lesion. Reduce or eliminate all forms of tobacco use. If you drink alcohol to excess, consider giving it up. If you are not a carrier of HPV – get vaccinated. If you notice any changes inside your mouth – report it to your dental professional promptly. Oral Cancer can affect anyone. It is a not a famous cancer, It doesn’t have any profile organizations or fancy fundraisers. 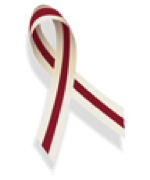 While we all know about the pink ribbons, hardly anyone knows that the red and white ribbon is the symbol for oral cancer. Yet it has been diagnosed in many famous people. Guess what all of these celebrities have in common? They are a just of few of the famous folks who have been diagnosed with oral cancer. I know I have done my job because there is at least one human being walking around our community right now, because I bugged, begged, pleaded and finally succeeded in getting this person to have a biopsy. Today they are alive and well, because their dentist (me) didn’t let a little white spot get ignored. Please be sure to get regular dental examinations and oral cancer testing! April 29th is a walk/run in Philadelphia for oral cancer awareness. Check out oralcancerphilly.org to learn more. Dr. McGann-Thank you for this informative and important article. Unfortunately, I just lost my mother to tongue cancer last June. She was an 83 year old, healthy woman. She never smoked, never drank or sat in the sun. Her cancer was found by her dentist at her 6 month exam. When she passed away, I sent a message with the sad news, and also urged my friends and family to be sure their dentists always check for oral cancer. So glad that awareness is being raised about this horrible disease!